Point Line Flow: Process Philosophy of Conditional Design. Jonathan Puckey at Resonate 2012. Process Philosophy of Conditional Design. Jonathan Puckey at Resonate 2012. Jonathan Puckey, co-founder of Amsterdam based Moniker design studio, held a presentation of his and Conditional Design group's creative philosophy at the Resonate Festival 2012 in Belgrade. The group was founded by Luna Maurer, EdoPaulus, Roel Wouters and Jonathan himself. The group put together the Conditional Design Manifesto to frame these common interests. The manifesto is of beautiful clarity and programmatic brevity, unlike the usual hammering style and fatiguing length of many an art manifesto. The subject of the manifesto spills way over the frame of design, and interests all creative disciplines, from literature to visual arts. For that reason, it is worth examining sentence by sentence, as Jonathan did at his talk. 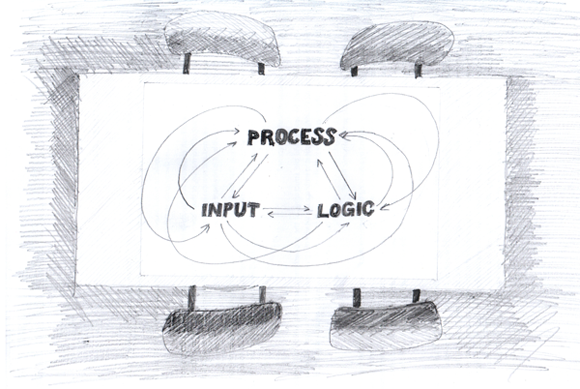 The basic equation or formula of Conditional Design is INPUT + LOGIC = PROCESS. 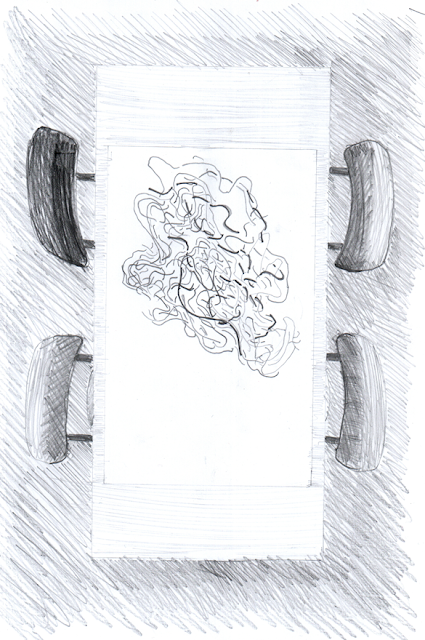 Drawing based on Jonathan Puckey's Zeitgeist project. 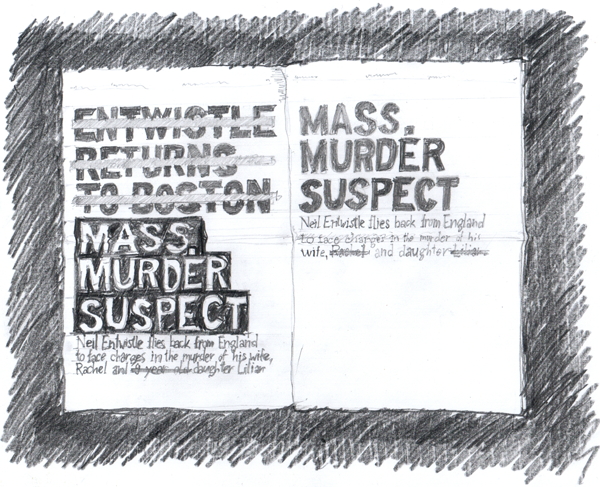 The illustrative example Jonathan presented is his Zeitgeist project. It shows how, building on input, logic and process can be shaped. Zeitgeist is a newspaper which prints all the editorial versions of a given headline story as they are modified over 24 hours. We are used to live in the stream of information, but we rarely have the tools to carefully examine what happened through time with the same headline. As it gets refreshed, previous versions vanish from our sight, whereas they can contain precious insights. This work is of amazing straightforwardness and complexity at the same time. It can be confronted with Joyce's incessant evolution of Finnegan's Wake, a never ending re-elaboration through which the process is revealed. On the other hand, input can come from the technology itself, or, from our use of technology. For a typographic project where Puckey moved letters along vertical axis, the idea came from an old typewriter which could be mis-used in that manner. “Input engages logic and activates and influences the process.” This is a too often over-looked point in visual arts, design and architecture where the logic imposes itself on the input and kind of creates it, and sometimes even falsifies it. The movement from observation and gathering of input up to the logic formation should be fluid, and I'd say, relational. “Logic is our tool.” A tool, not a finality, as in much of conceptual art, and in so-called Process Art as well. What exactly is logic to be used for? “Logic is our method for accentuating the ungraspable. This affirmation is wonderfully poetical and practical at the same time. Logic seems to be an instrument to find out the parts of the input that are eccentric, anomalous, and not to reduce all the parts in a homogenous mass. Drawing based on Conditional Knots Drawing. “We use logic to design the conditions through which the process can take place. Conditional Design put this in practice by a series of workshopes intitled Conditional Design Tuesdays. Each week, a member of the group would invent a set of rules, and then they would collectively try them out on a collective drawing. The series of exercises is worthwhile looking entirely. What is greatly inspiring is Jonathan's observation on the nature of the mistake the Kaleidoscope workshop. This drawing consisted in persons “leading” the drawing for 30 seconds each, whereas the other three, at the same time, tried to mirror his drawing. Naturally, as drawing evolved, they made mistakes. What happened eventually is that some continued drawing from the mistake, which caused a great deal of confusion among other participants. So the others were in some way compelled to introduce the mistake in their drawings too. This is a wonderful example of “learning by doing”, of continuous adjustments of the process as it goes on. Conditional Drawings challenge the logic of bottom-up and top-down organisation of participatory art projects. The appearance of the mistake in the process refreshes also the input over time, so the initial conditions of the process do not remain unvaried. It is a reminder that we should keep our eye on the entirety of the process over time. 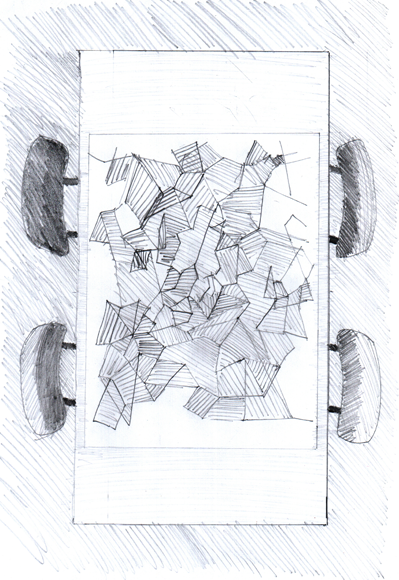 Drawing based on Conditional Hatching Drawing. So, contrary to expectations, more stricter the rules are, more sensible parts of the environment are highlighted, but we should try not to forget the rules. Difference should have a reason. These statements are certainly useful, but the constraint is not an unsurpassable wall. Improvisation emerges, and some of Conditional Design projects nuance the constraint. This is a significant distinction, as it draws the line between the definite result, and a possibly infinite series of possible outcomes or formations. This is highlighted in the public space project the group distributed the stickers to be glued on the floor following a single rule, not to put them from other stickers at greater distance than the length of the sticker. A multitude of persons, respecting the rules, eventually used them in a variety of manners. Highly organised forms surfaced, as well as pretty unordered ones. This is a significant statement, as we should bear in mind that we are those who invent the logic or the rules. It is a back and forth movement between our subjectivity and subjectivity-made-logic, provisional objectivity. As Jonathan says: “maybe the input fights, or collaborates with logic, maybe it dances with it (..)”. This constitutes the poetic part of any process. These are some ideas that can be quite useful in arts in general. Many an art project is way too often closed by the a priori established and fixed input and logic, so it seems only like their mechanical realisation. Worst of all, this makes the whole project entirely predictable and dull.Conditional Design, instead, is not anchored on conditions, but it springs from them. What happened over time is that the artists asked visitors to bring them new objects, and, one of the participants, Dušanka Komnenić, got hold of more masking tape so she eventually moved her confinement around the space, eventually reaching the door. There can be many other examples as well.